2012 marks 20 years of Open Studio Weekend in Vermont and is a unique opportunity for people to meet a wide variety of artists and craftspeople in their studios, some of which are open to the public only during this event. As always, the two-day event is held Memorial Day weekend, this year on May 26th and 27th. Visitors will be able to learn how art and craft is made at the studios of glass blowers, jewelers, printmakers, potters, furniture makers, weavers, ironworkers, painters, sculptors, quilt makers and wood carvers. Many galleries will also host gallery talks and feature special exhibits in conjunction with Vermont Open Studio Weekend. Brandon has 11 sites listed on the official map: sites #96 thru 106, most of them BAG members. 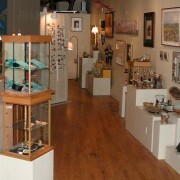 Patty Sgrecci, Lee Greenwalt, Susan Smith-Hunter, Joan Curtis, Warren Kimble, Rebecca Zelis, Laura Rideout, Judith Reilly, the BAG gallery and the Granary on the corner of Union St. and Railroad Ave.
Althea Bilodeau and Kathryn Milillo are BAG members at site #95. They are located in North Chittenden. Others are Karen Deets #94 in Fair Haven, Stacey Stanhope #107 in Orwell, Barbara Ekedahl #109 in Lincoln, and Mike Mayone #113 in East Middlebury. Several BAG artists will set up in the Granary site: George Wetmore, Jill Listzwan, Linda Evans, with the possibility of more to come. Vermont Spring Open Studio Weekend is a statewide celebration of the visual arts and the creative process in which Vermont artists and craftspeople invite the public to visit them in their studios. The Vermont Crafts Council launched Open Studio Weekend in 1993 as a way to increase the visibility of artists and craftspeople in Vermont. The event’s goal is to foster an appreciation for the creative process and the role that artists and craftspeople play in the vitality of Vermont’s communities.